Michael and Paul will be performing on Friday 20th February at the Old Well Theatre in Moffat. Their unique blend of world music will include a selection of Hungarian Gypsy melodies, Argentine Tango, and traditional Scottish tunes. The concert starts at 7.30pm. 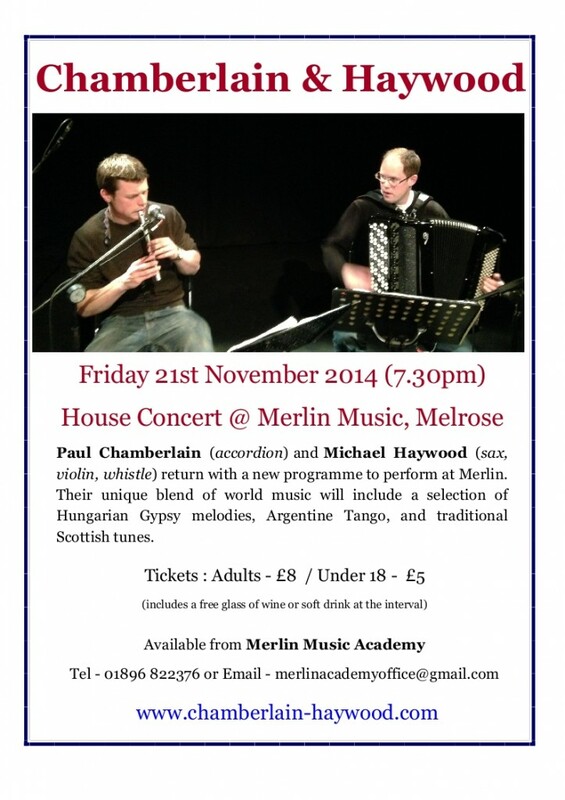 Notes: Paul Chamberlain (accordion) & Michael Haywood (Sax, fiddle, whistle, clarinet) return to perform at Merlin Music with another exciting programme featuring Tango, Balkan, French, Scottish and Russian Music.